Alfred W. McCoy. Policing America’s Empire: The United States, the Philippines, and the Rise of the Surveillance State. Madison: University of Wisconsin Press, 2009. At the dawn of the twentieth century, the U.S. Army swiftly occupied Manila and then plunged into a decade-long pacification campaign with striking parallels to today’s war in Iraq. Armed with cutting-edge technology from America’s first information revolution, the U.S. colonial regime created the most modern police and intelligence units anywhere under the American flag. 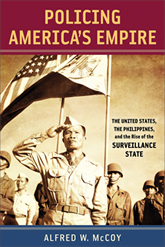 In Policing America’s Empire Alfred W. McCoy shows how this imperial panopticon slowly crushed the Filipino revolutionary movement with a lethal mix of firepower, surveillance, and incriminating information. Even after Washington freed its colony and won global power in 1945, it would intervene in the Philippines periodically for the next half-century—using the country as a laboratory for counterinsurgency and rearming local security forces for repression. In trying to create a democracy in the Philippines, the United States unleashed profoundly undemocratic forces that persist to the present day. But security techniques bred in the tropical hothouse of colonial rule were not contained, McCoy shows, at this remote periphery of American power. Migrating homeward through both personnel and policies, these innovations helped shape a new federal security apparatus during World War I. Once established under the pressures of wartime mobilization, this distinctively American system of public- private surveillance persisted in various forms for the next fifty years, as an omnipresent, sub rosa matrix that honeycombed U.S. society with active informers, secretive civilian organizations, and government counterintelligence agencies. In each succeeding global crisis, this covert nexus expanded its domestic operations, producing new contraventions of civil liberties—from the harassment of labor activists and ethnic communities during World War I, to the mass incarceration of Japanese Americans during World War II, all the way to the secret blacklisting of suspected communists during the Cold War.